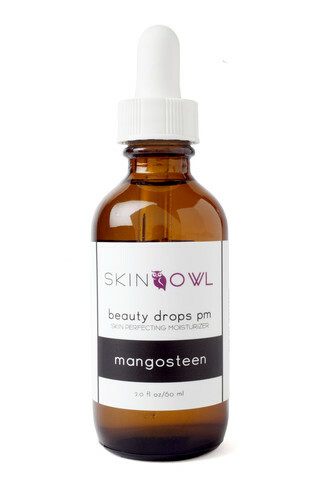 Beauty Drops PM Mangosteen New in February at LLB! Revive your skin from the outside in with this oxygenating oil intended to de-stress lackluster skin in need of a boost. Recharge and reverse signs of fatigue with this nighttime elixir and watch skin visibly transform within hours. Powerful xanthones work to heal cells damaged by free radicals and slow down the aging process. Mangosteen's natural antibacterial properties and antimicrobial compounds visibly correct skin blemishes, oily skin and chronic dry skin. Coupled with the superior powers of organic, cold-pressed South African Baobab Oil, this exquisite oil absorbs quickly and is designed to act as a high level anti-bacterial, anti-viral, anti-inflammatory. This superfruit oil has unmatched benefits for all skin types and promotes ultimate skin health and beauty. Night: After washing your face, use half of one eyedropper vial. Warm oil in hands and massage onto the skin. Breathe in the sweet scent of Mangosteen as you unwind and settle into your evening. Use in conjunction with your Lavender, Geranium, or Clary Sage Beauty Drops AM. Raw, Organic, cold-pressed African Adansonia digitata (Baobab) Oil, Pure Garcinia mangostana (Mangosteen) Oil.